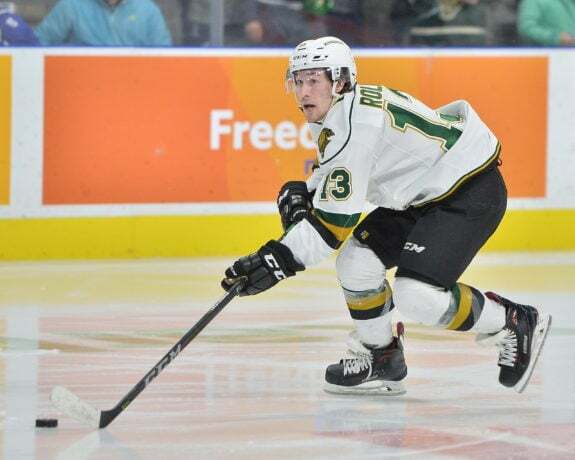 When Tyler Rollo was traded to the London Knights just three games into the 2017-18 season from the Peterborough Petes, the 20-year-old forward didn’t know what to expect with his new club. Names like Robert Thomas, Cliff Pu and Sam Miletic littered the Knights’ roster and from a team standpoint, it was one that perennially demanded success. But like most teams in any given sport, each player is expected to play a particular role. In hockey, there’s the sniper, the playmaker, the leader – and the list goes on. What Rollo did when he came over to the Knights was buy in to the system that was already in place. He wasn’t expected to be the team’s leading scorer or a big physical presence within their lineup. Instead, he’s found a way to fit in by flying under the radar and playing a leadership role as one of the older players on the team. And that became even more evident when the Knights moved four of their top scorers at the deadline. That’s when Rollo was handed an ‘A’ as part of the team’s leadership team and that’s when his role as a veteran on the club really became clearer to those on the outside looking in. Rollo: A Leader by Default? As a guy with only 21 points in 62 games with the Petes coming over to the Knights left a lot of questions even for the team. But Rollo quickly became a go-to for Dale Hunter on the penalty kill as his speed was tool that the coaching staff could exploit. While he only had 62 games before his Knights debut, it was more OHL experience than a number of the players already on London’s roster. Cue the leadership role. With the trades at the deadline, Rollo became one of the most veteran junior players on the team. He experienced playoff hockey with the Petes in 2016-17 and that gave him even more to share with the younger players on the team. While the trades left a number of questions, Rollo explained that the older players on the team weren’t ready to throw in the towel on a season that surely had playoffs written all over it. Even in the toughest times, it’s up to the veterans to play a motivational role. Rollo took on that role and found a way to help the team work their way into the fifth spot in the OHL’s Western Conference. On top of accepting his role with the team, Rollo also had the responsibility of fitting into a new city with new billets and new teammates all at once. And with a building that holds roughly 9,000 fans, there’s an expectation that comes with being a Knight – one that Rollo wholeheartedly accepted upon being traded to London. While it surely isn’t an easy thing to do, the young forward quickly found a home in London and made the best of the transition to his new club. It’s something that he’ll remember as his junior career comes to an end after the 2017-18 playoffs. Before their final regular season game at Budweiser Gardens, the Knights’ organization honoured their over-agers in Rollo and defenceman Shane Collins. Rollo tallied a goal in the game to helping him to his best season in junior with 12 goals and 34 points. But it was the moment pre-game and the message he’ll leave behind that stood out for Rollo and his teammates. “I’d like to say thanks for what they did for me at the beginning of the game. It means a lot. I’m sure my family appreciated it as well,” he said about the pre-game ceremony. While it may have only been one year of his short junior career, the role he’s played in helping the young squad develop is one that his teammates and the coaching staff will surely remember as Rollo takes the next step in his career. That said, he will always have a place among the London Knights.